You can share your re-creation of this recipe or any other recipe from Rasoi Recipe on our Facebook page or directly mail it to me on rasoirecipe@gmail.com . I would love to hear from you guys. If you have any suggestions or if you want to share your views or appreciation you can leave your message in the comment section below. ? For more non veg recipe you can check Easy Chicken Curry , Chicken Chili , Bhuna Murgh (Chicken with yoghurt and cream) , Chatpata Chicken Tikka , Bhuna Gosht (Lamb cooked with desi masalas) . 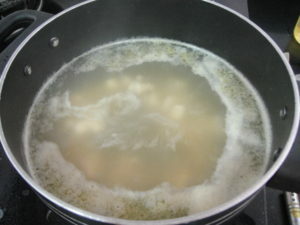 In a deep saucepan boil chicken stock. 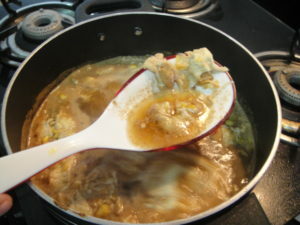 Add chicken pieces in the stock, let it cook for 5 mins. 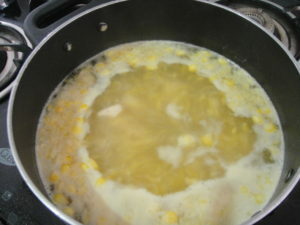 In the meantime, in the mixer mash corn kernels slightly. Add mashed corn kernels and chopped ginger in the pan, let it cook for 15 mins more. 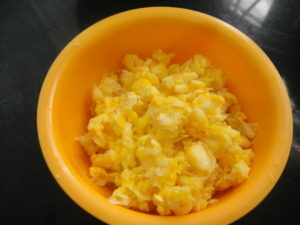 Beat egg in a small bowl, slowly pour egg in the pan. 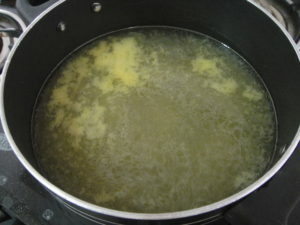 Do not stir soup at this point, allow egg to cook for 2-3 mins. 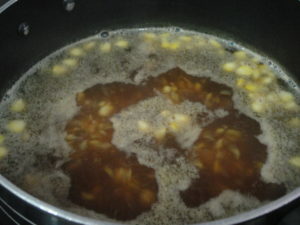 Start stirring soup when white ribbons starts swirling in the soup. In a small bowl mix properly cornflour and 4 tbsp water. Add this mix in the soup, allow soup to thickens. Garnish soup with chopped coriander and serve immediately. Chicken stock recipe: In a pan boil water with chicken pieces, chicken bones, black peppercorn, bay leaves, onion, cloves, chicken cube(optional), and some optional vegetables (carrots and celery). Cook this mix on low flame and let it boil for at least 30 mins. Keep on skimming stock regularly. 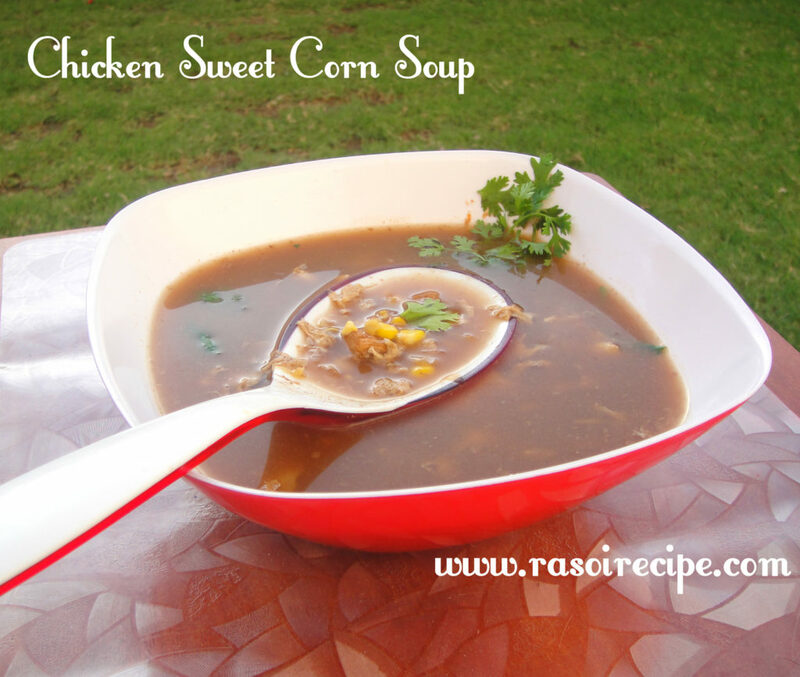 Pass stock through sieve, store stock in refrigerate for soup and other recipes. 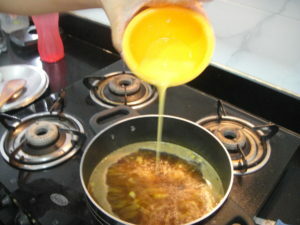 This is how I prepare my chicken stock. 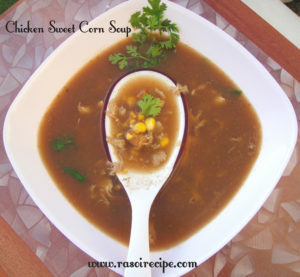 Chicken stock cubes are also available in market, you can also use it. For garnishing you can also use green part of spring onion. Chilli flakes are optional, you can skip.